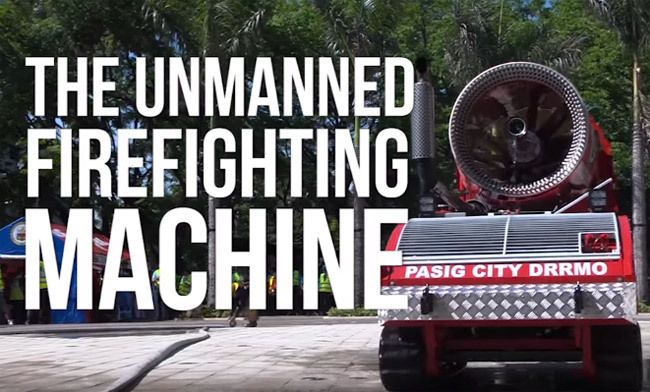 The Pasig City government recently acquired an unmanned firefighting machine that can pump 2,500 liters of water per minute. The UFM which is remotely controlled can lessen the risks for firefighters who face constant danger on the job. The UFM may seem smaller than a standard fire truck; it is actually one strong firefighting weapon. It can pump a combination of high pressured air and water to put out fire. It runs on continuous track wheels with only one man remotely controlling the machine. Aside from shooting water to suppress fire, it can also blow air to clear smoke and toxic gases, allowing the rescue team to enter the scene and look for survivors. The machine is first of its kind in the country. During a turnover ceremony on April 24, Pasig City Mayor Robert Eusebio shared that the city council acquired the Php19-million machine to address the inability of the city’s fire department to fight large factory and industrial fires. It can also solve the problem of narrow streets that fire trucks have trouble getting to whenever there is a fire. Additionally, it can be used during factory, basement, and chemical fires where humans would not be advised to enter. The machine, due to its remote-control capability, can go in place of humans. It can help save the lives of fire fighters and victims alike. A German-based company named LUF brought the UFM in October 2016 in the Philippines. It was first used during the Trinoma Mall Fire in Quezon City last March 14. The acquisition of the property is in line with the city’s mitigation and response initiatives that focus on 3 areas; flooding, earthquakes and fire.